…and finished just in time for Girls’ Knitting Afternoon! I think the R will like it, too. The other R will get some handspun from me sooner or later, when I am inspired by something she would like. Everything must balance in the world of twins, you know, especially when you’re the Auntie to two Incredible R’s. I stuck the little ribbed top of my Jaywalker sock in the picture, just because. I can hardly say I’ve started, but I do have this much to show. I love this color, this Moss Agate that’s all green and purple and best of all deep golden orange. I’d like enough of it for a sweater, please. I don’t know what this Knitting Afternoon will hold, beyond the fun, that is. I am going to teach the R’s to knit, and it seems like just yesterday — not twelve years ago — that I was knitting two little lace hats for Baby A and Baby B in anticipation of their arrival. I went out early to get apples and cheese and most of the other do-dads I’ll need for my part of the Thanksgiving dinner. I spend the day with J and her family, since I can’t usually get away to be with my own family, and J and I cook and chatter all day. I’ve added some of my own traditions to the gathering — we use my grandmother’s white linen tablecloth, and make my mother’s cranberry relish, and until this year, my mother has made the trip up here from Maryland. She’s not able to do that any more. I used to stress about her visits (oh, the story is a loooong one), but not having her here now just makes me sad. I’ll need the laughter and the cooking and the knitting-while-the-turkey-cooks (because you can be sure we’ll want to get in a little practice!). It’s time to pack up the yarn and the needles and the books and the camera. Off I go! As per your usual ability to make me drool & ooh & aah over your photo posts, this one is just the same!Have a tasty & lovely T’giving. Those socks are going to be gorgeous – can’t wait to see them. I may have to find some fabu yarn and do that pattern for a pair for myself (gee, I’m such a follower)n *grins*Have a great Turkey Day! Oooo – lucky girls! Lucky you too, to get to teach this glorious art to the next generation. Very pretty yarn too. JaneYou are very lucky to have 2 nieces who want to learn how to knit! And they are lucky to have you to teach them. Don’t we all remember the person who taught us to knit? Have a Happy Thanksgiving! 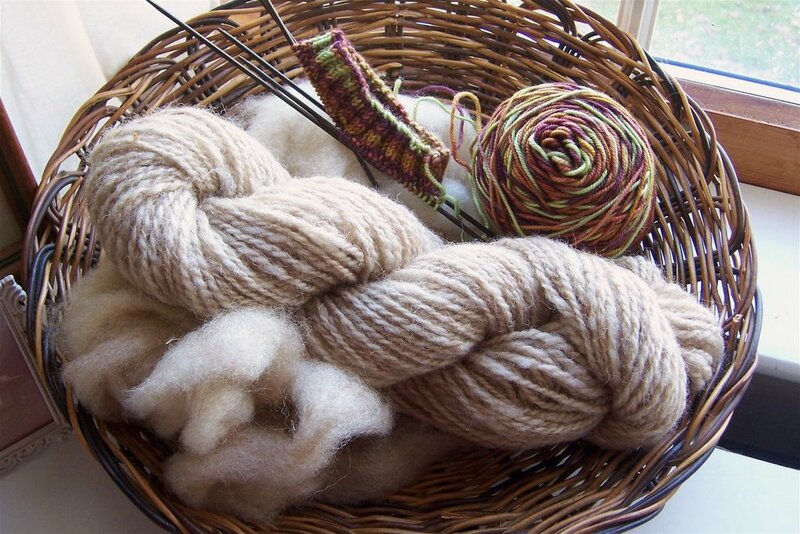 AND that skein in the basket looks delicious. I could just eat that one.